In 1704 the town of Wigoltingen, Switzerland, built a city hall in which were placed 13 painted window panes which depicted the coats of arms of the community. On the third window was the coat of arms of the Freienmuth family inscribed with these words: "Daniel Freyenmuth, Citizen of Wigoltingen and Sontersweilen." Under the next is an inscription: "Johannes Ulrich Freyenmuth, churchwarden, treasurer and Judge of Wigoltingen, 1704." 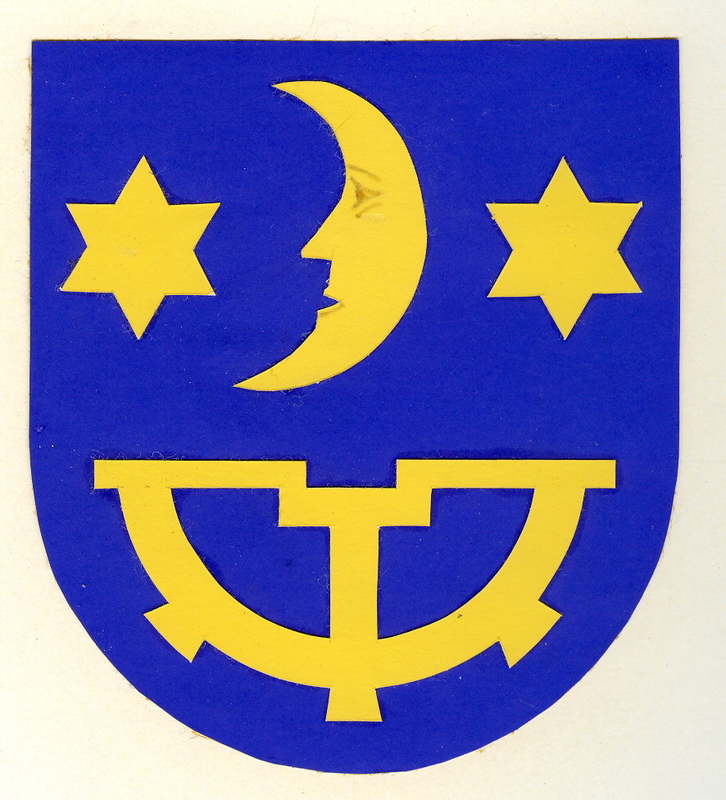 The coat of arms is a blue shield containing a half mill stone and over it a half moon and two stars. 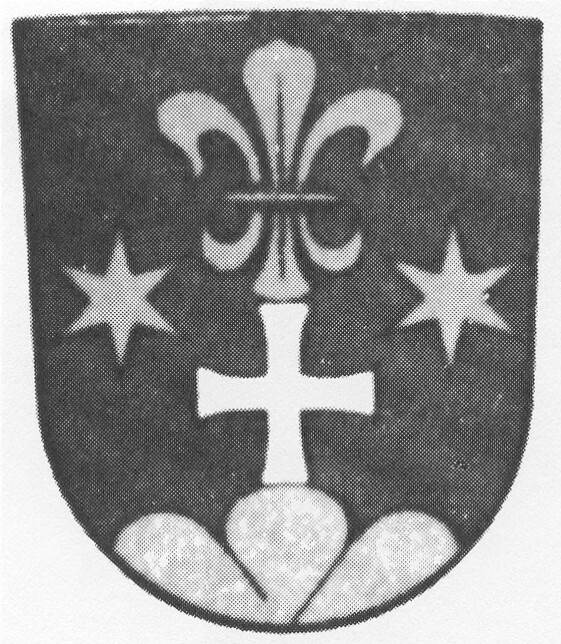 This coat of arms was found in 1707 and 1727 in the shooting gallery in Wellhausen. These items were engraved on a bell in the Wigoltingen City Hall. The bell was given to Johann Jakob Freyenmuth, Mayor from 1803-1853. In a village history from Hans Nater in Schlatt, called "Old Hugelshofen" it was reported that the old Kammen Brook bridge in Mannenmühle was torn away by a terrible storm and flood about 1900 and the sandstone head block from the bridge was buried in the brook. During the construction of the new bridge about 1950, the stone had been found in the mud and was then placed in its key position. 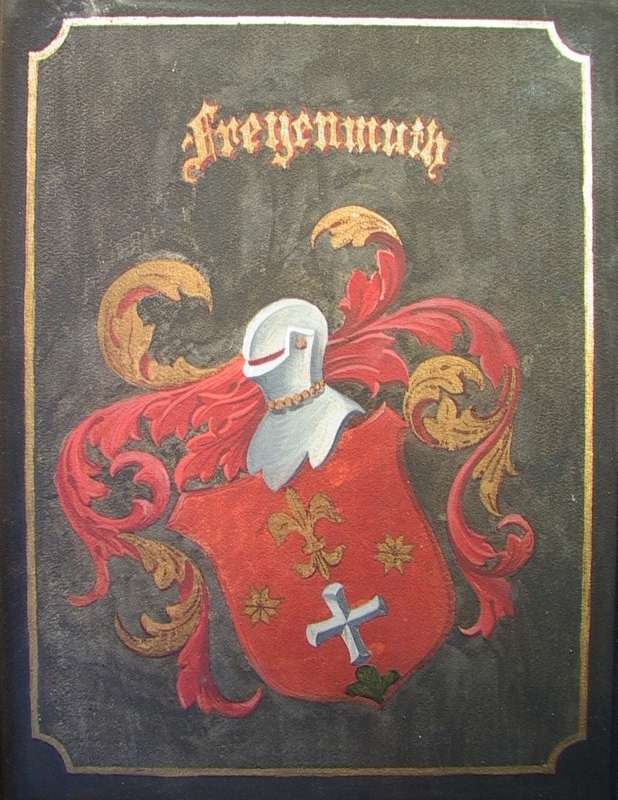 Anna Freienmuth used this version of the family coat of arms to produce the sketch shown here and the watercolor image at the top of this page. William Leland Freienmuth and his wife visited Heinrich Spiri in Ottoberg in August 1977. During the visit Heinrich took them to visit Mannenmühle. While there, Heinrich pointed out that the keystone in the bridge over the Kammen Brook had the family crest on it. The image was in relief, the stone was quite dark and there was very little contrast. William took several photos of the stone, after which he projected the image from the slide photo onto paper and traced the image freehand. This is the photo of the bridge keystone taken by William L. Freienmuth, from which he made the tracing above. The date on the keystone is 1848. 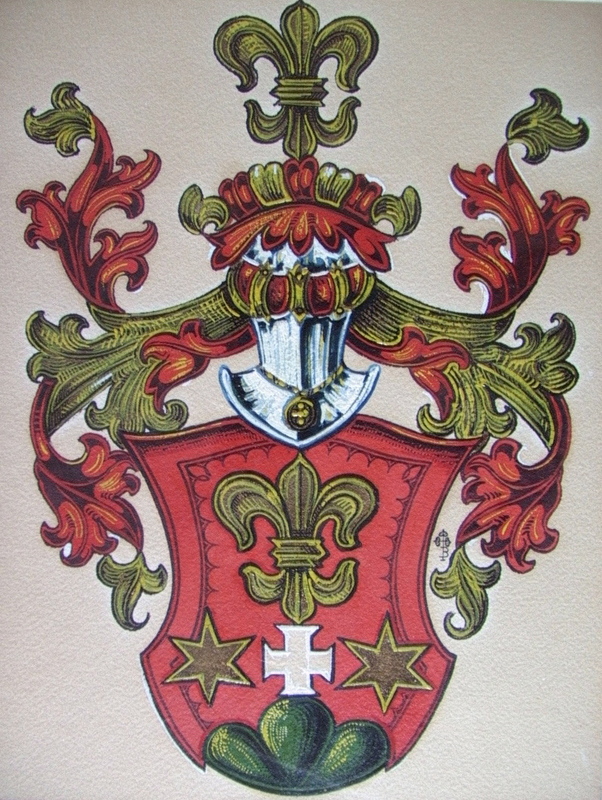 This coat of arms was from Wellhausen and Wigoltingen; the seal from the Hüeblin collection (see the Thurgau Year Book 1937) and is from 1882 and 1903. 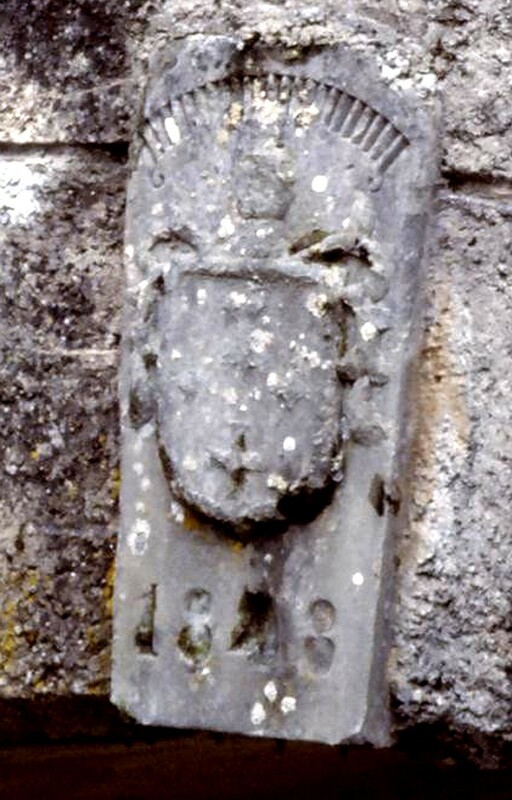 This looks like the image that is on the keystone of the bridge at Mannenmühle. In April 1962 an exhibition in Zurich, Switzerland displayed family trees, crests and old documents. 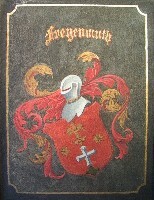 The official Freienmuth crest shown here was included in the display. The moon and stars and millstone are yellow. The background is blue. 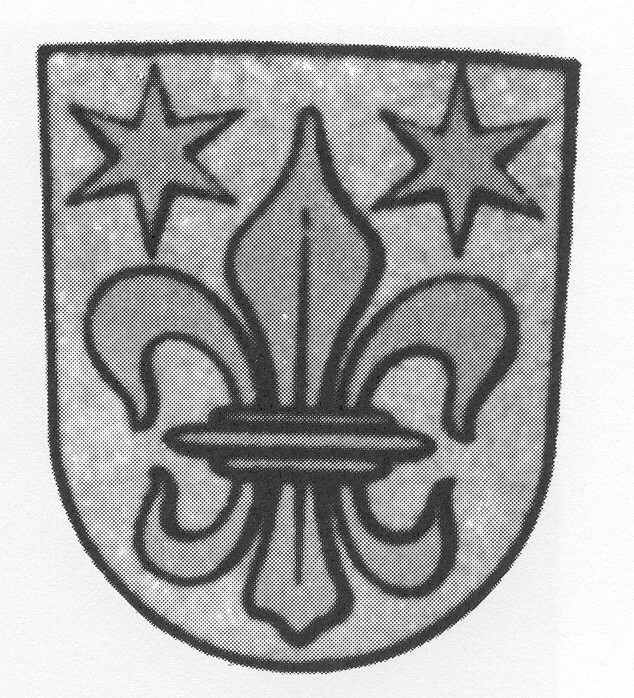 Several other crests exist but this one is preferred, as confirmed by Max Freienmuth, Unterdorf, Steinhausen, Switzerland during his visit to the United States in 1986. 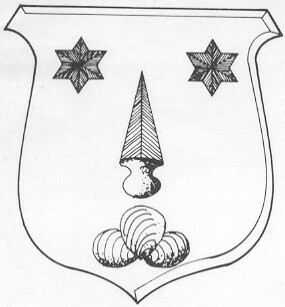 This coat of arms was drawn by A.A. Norris, Jr., of Rockville, Maryland. It was prepared from the image in the Freienmuth book, photos of the keystone at the Kammen Brook bridge at Mannenmühle and color photos of a page in a book in a museum in Frauenfeld. The mantle and helmet were added by the artist - he has a hobby of heraldry and is expert in such things - says only the coat of arms is registered; the rest is up to the artist. 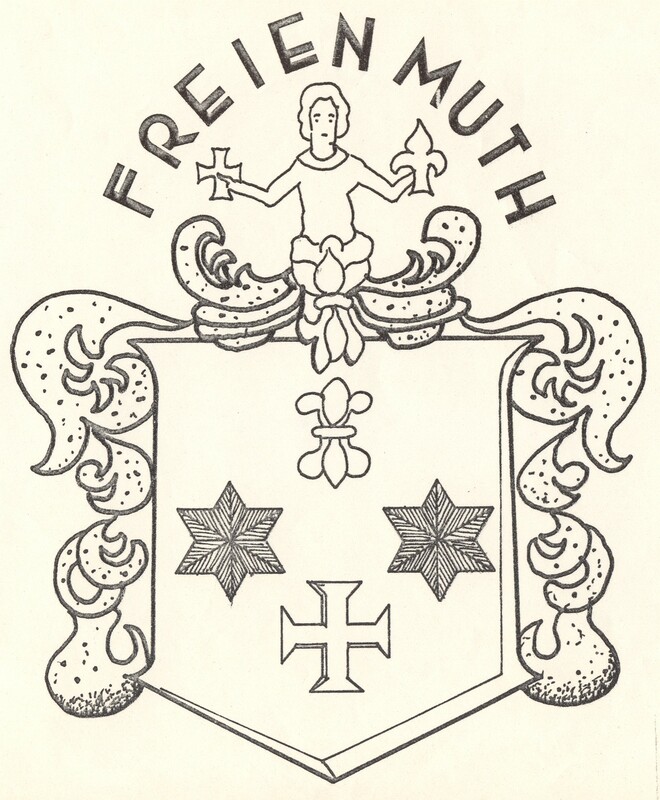 If there is an authentic coat of arms for this branch of Freienmuths who emigrated to America, this is most likely it. 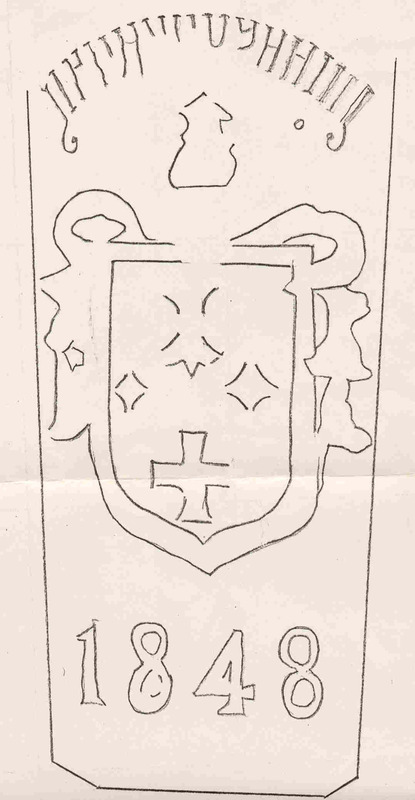 This coat of arms for Ernst Edward was found on a tile from the Angélico Chávez History Library, Palace of the Governors, Santa Fe, New Mexico. In July of 2008, I received an email from Philip Freyenmuth of Lucerne, Switzerland. 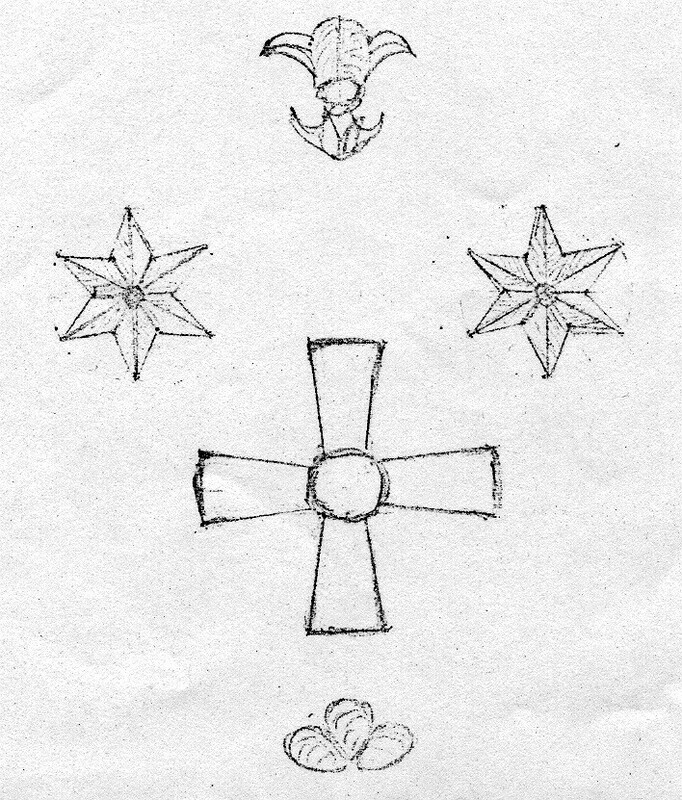 His grandfather had given him a seal and two pieces of artwork, one of which is shown here. His ancestry goes back to Hans Caspar Freyenmuth, born 1634. This contact by Philip enabled me to add two generations to my ancestry, because of his research from the cantonal archives in Switzerland. 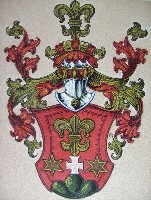 This is the second coat of arms from Philip Freyenmuth. 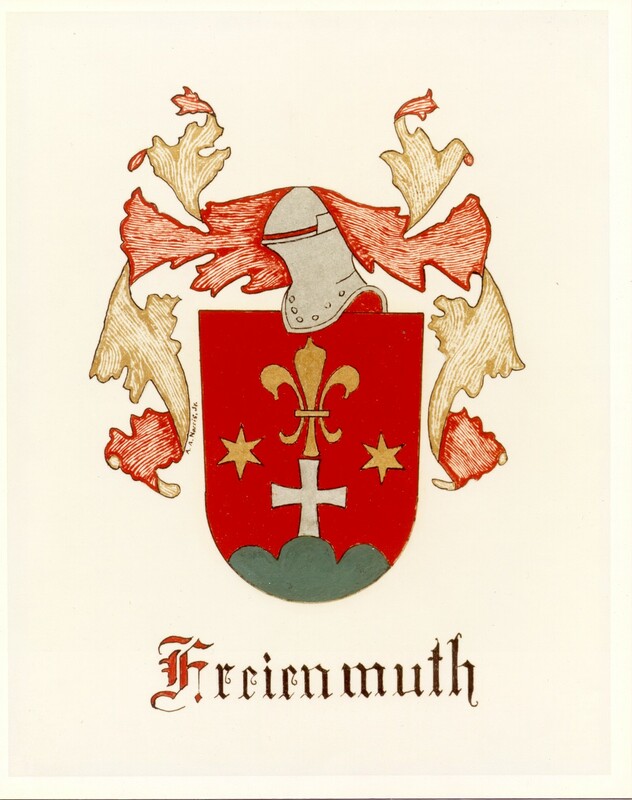 Based on the great similarity between the Freienmuth coats of arms, I believe that our families were descended from the same patriarch, but there is much research to be done to confirm that.